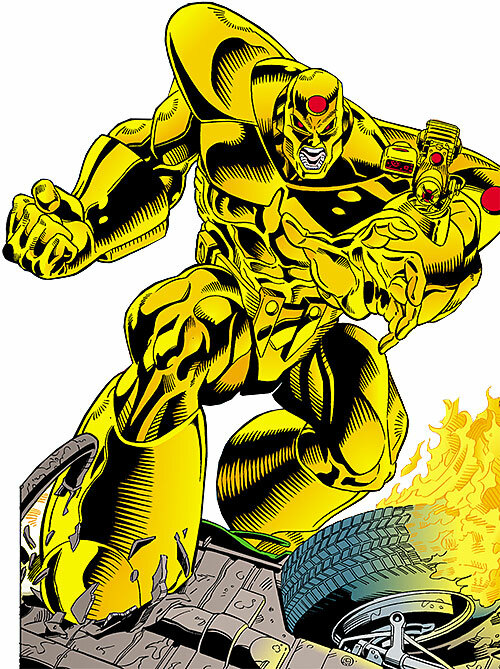 Mecha was one of the B-lister heroes during the launch of the Comics’ Greatest World, a new super-hero setting from Dark Horse, in 1995. The comics market in the US tanked not too long after that, so Mecha never had much of a chance to shine. He did get a special one-shot, though. Known Relatives: Father, mother, sister, Cheryl (sister). Group Affiliation: Former member of the Agents of Change. Base Of Operations: Formerly Golden City, now Mobile. Height: 7’ Weight: 1000 lbs. At first, Mecha thought he was wearing a suit of alien power armor . Then, he thought he was trapped in a suit of power armor, as there was no way to remove it. Later, he came to the realisation that he *is* a suit of alien power armor. There does not seem to be flesh and blood — his body — in the suit anymore, although the skeleton and some organs might remain. Can fly at high speeds. Can extrude energy cannons from its forearms. It also has numerous sensors and a powerful HUD. In DC Heroes RPG terms this later feature contributes to Mecha’s INT, as the environment he sees is clearly labelled and color coded, allowing for enhanced decision taking. USMC Private Art Thomasson was part of one of the various teams the US military lost inside the Vortex. These were sent to their highly probable death in futile attempts to learn more about that phenomenon. Although reported to be dead in action, he was, unknown to the military, one of the very few that actually survived. 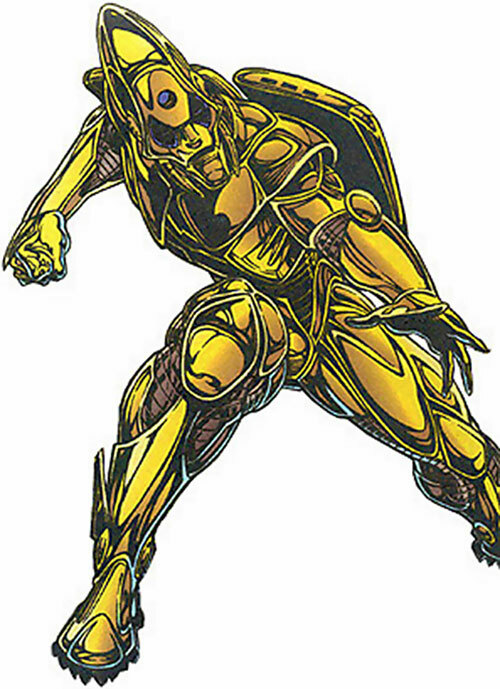 For him, survival meant merging with the suit of armour originally worn by the alien scientist behind the Vortex when he came to Earth. The altruistic and slightly naïve Thomasson went to Golden City. He saw himself as a hero and wanting to associate with other “cool heroes”. Grace allowed it, and he joined the Agents of Change just in the middle of their fight with Warmaker. Mecha stayed with the Agents until the takeover by Law (whom he never trusted). He was then expelled from the team. Law’s method to force Thomasson out was simple. He demonstrated that he was immune to Mecha’s Vortex-powered abilities. Then he started killing random persons in the room, saying he’d only stop slaughtering innocents when Mecha left. Mecha continued to train with his “armour” on his own. He eventually learned to switch the suit to various modes (such as defensive mode or speed mode) at will. He also started to have dreams of a powerful alien civilisation of warriors, all wearing armors like his. The person Thomasson was dreaming of underwent rites of passage. This is probably an involuntary access to a sort of audiovisual database of past events. Thomasson is a nice, helpful young man. He grew up among a loving family in the countryside. A large part of his personality was moulded by the USMC. He thus sees himself as a good soldier. Art usually uses military turns of phrase, follows orders and the law, and aims to act rationally and with tactical acumen. 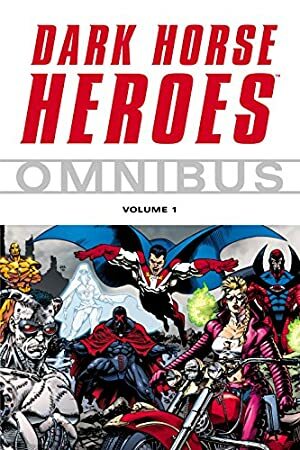 His view of a super-hero’s role has a bit of the peacekeeping mission of the USMC military police in it. He sometimes had troubles with the suit feeding him too much information. But he overcame this issue through constant training. 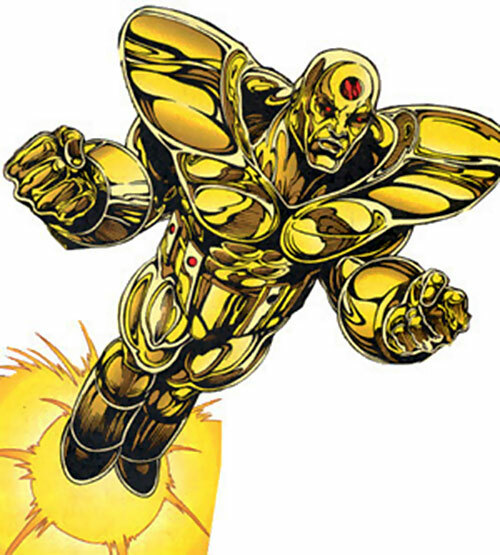 Golden City is an interesting theme, and it and its super beings would make an interesting scenario for a JLA adventure. 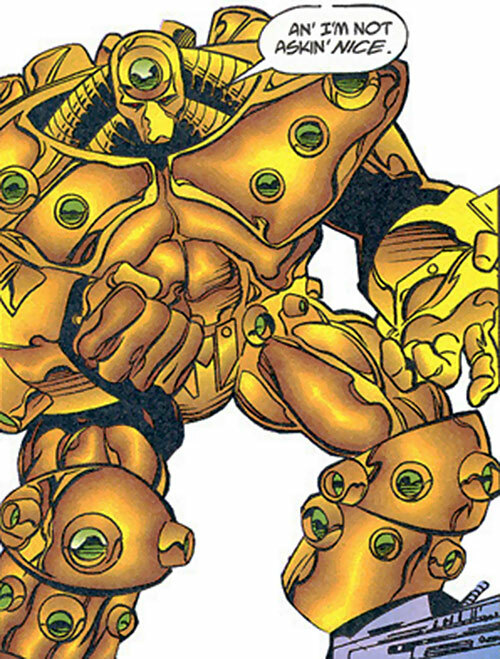 You could also Amalgamate it and the city created by the Ultramarines – a team that Mecha could easily join if you don’t use the whole of Golden City. Density Increase is Always On (-1) and already factored in. Power Reserve is A Minor Marginal Power. Power Reserve cannot boost anything by more than five APs, save for Superspeed (-2). The Mecha suit can change configuration between various modes. That changes its exact look, but keeping the same basic theme. This is represented by the Power Reserve. Much of the know-how in the Mecha suit use is knowing how to use modes to their best advantage, and having the necessary stamina and skill to switch between modes. Baseline mode is represented by the first illustration. Offensive mode is pictured below the baseline mode. The Power Reserve is used for STR +05, DEX +02, Energy blast +03. Defensive mode is pictured below the offensive mode. The Power Reserve is used for BODY +05, STR +03 and Energy blast +02. Speed mode is illustrated last. The Power Reserve is used for Superspeed +10. The Stealth mode is invisible. The Power Reserve is used for Invisibility +05, Acuity +03, DEX +02.